I this has been a thing since, like, FOREVER – but this is my new habit – making and giving thank you cards! They are good for the soul. I’ve always loved sharing random acts of kindness, and this is in the same family. It’s not for random people, but for random reasons. Things are nuts in the world right now. People near and far and very stressed out about the news, politics, finances, back to school, all kinds of things. So why not be the balance? One act of kindness and gratitude can change a mood quickly! Plus, it feels great! This is Rina from when we were at Sizzix last month. 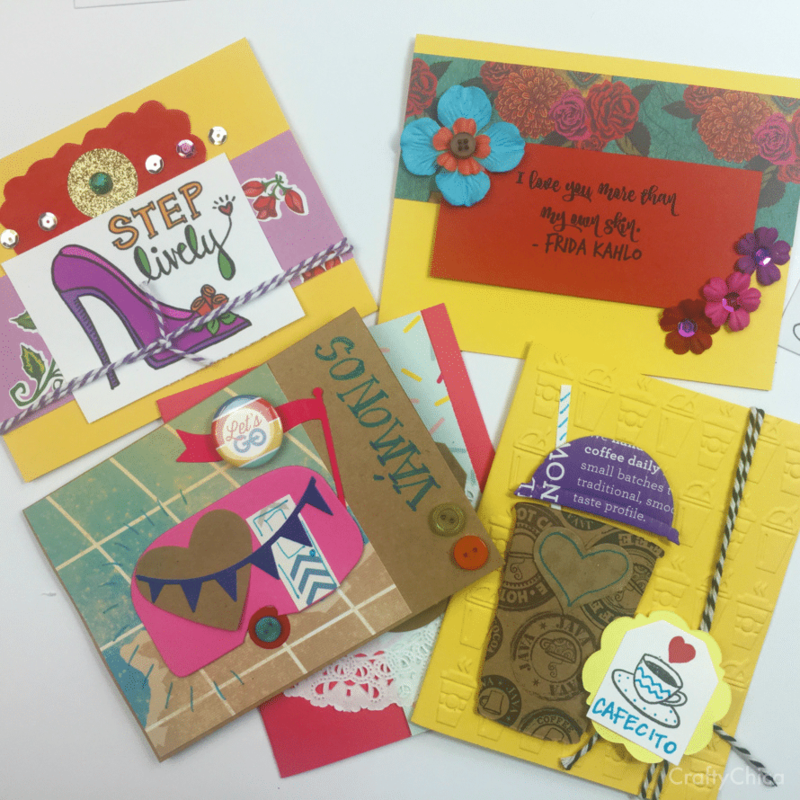 My inspiration is my friend Rina Gonzales from Mothership Scrapbook Gal. 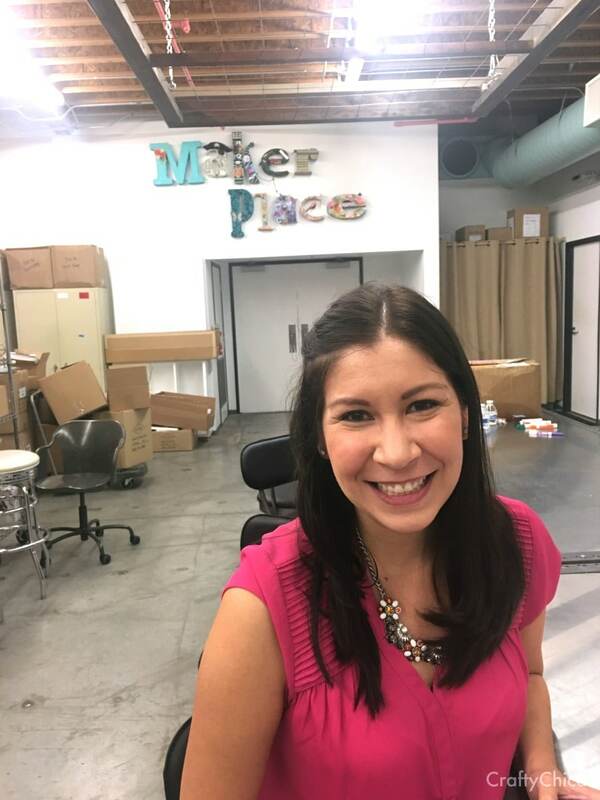 She has built a side business (she is a lawyer by day) blogging and running an event called Crafty Happy Hour where people visit a bar, coffeehouse or her studio and make cards. 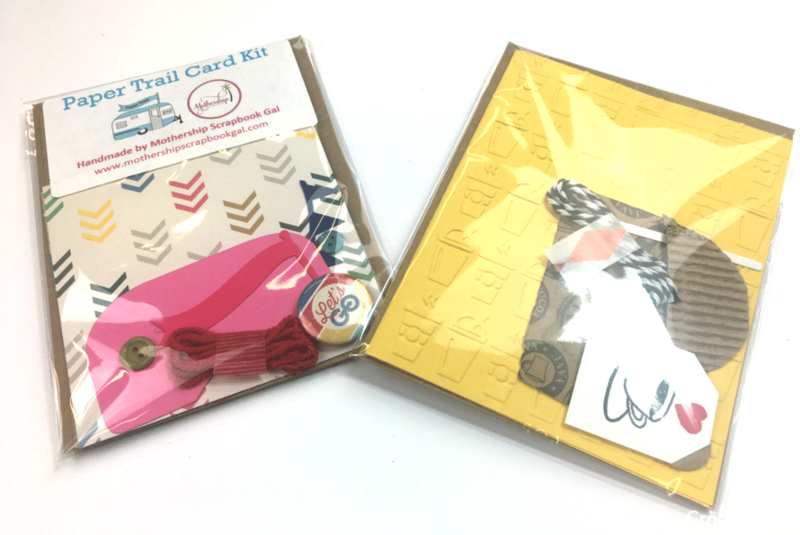 She cuts, preps and assembles all kinds of creative card kits! It got me thinking, if you are crafty and love paper arts, why not make a stack of thank you cards ready to go that you can send out as needed. 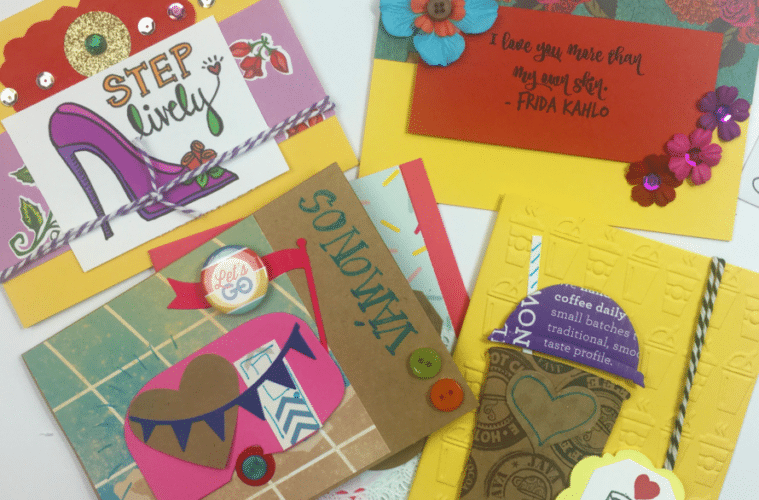 I’m not an avid paper crafter, more of a general crafter, but I could see myself sitting down and cranking about a couple dozen fabulous cards out of sheer happiness! Here’s a short cut to make your own: Check out the dollar bins at the craft store. They often have really nice, bright and colorful boxes of blank cards on the cheap. Use those as your base. 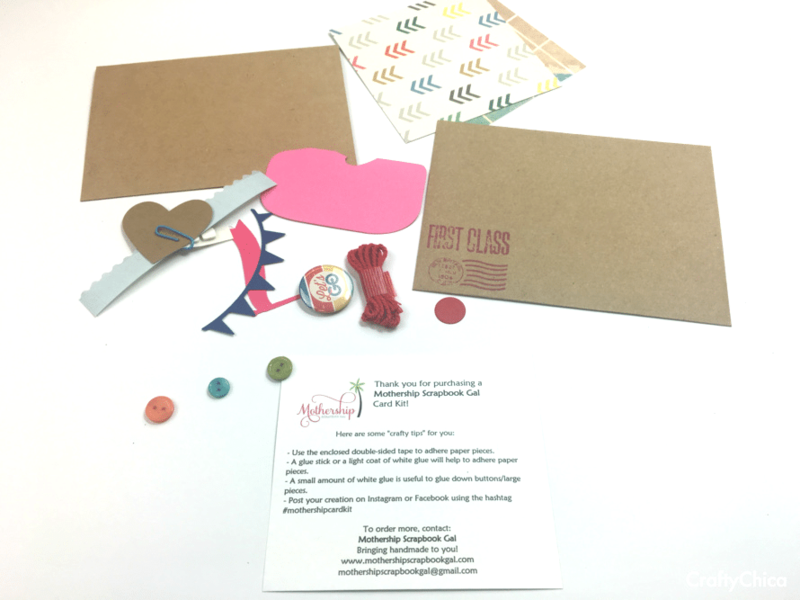 Even if you don’t have a die cut machine, you can buy pre-cut hearts and tags. For the front you can print out your favorite quotes or use collage images bought from Etsy. Just a mishmash of all kinds of papers! The cards don’t have to say THANK YOU – it’s the sentiment that counts! As far as stamps, you can buy a sheet from usps.com and they’ll have them delivered to your house within a couple days. 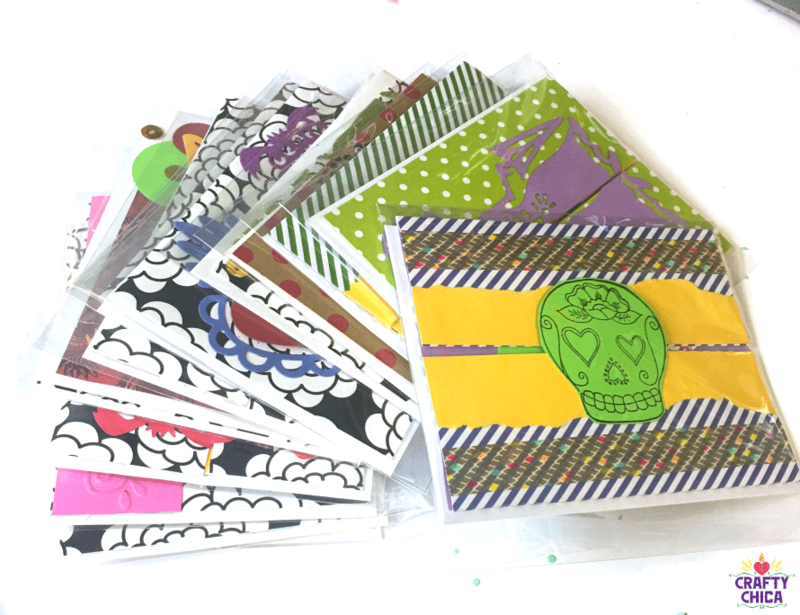 OR, you can buy Rina’s card kits that are good to go! When I saw her last month, she gave me a couple to play with. They are so fun! She includes everything you need to make a card. 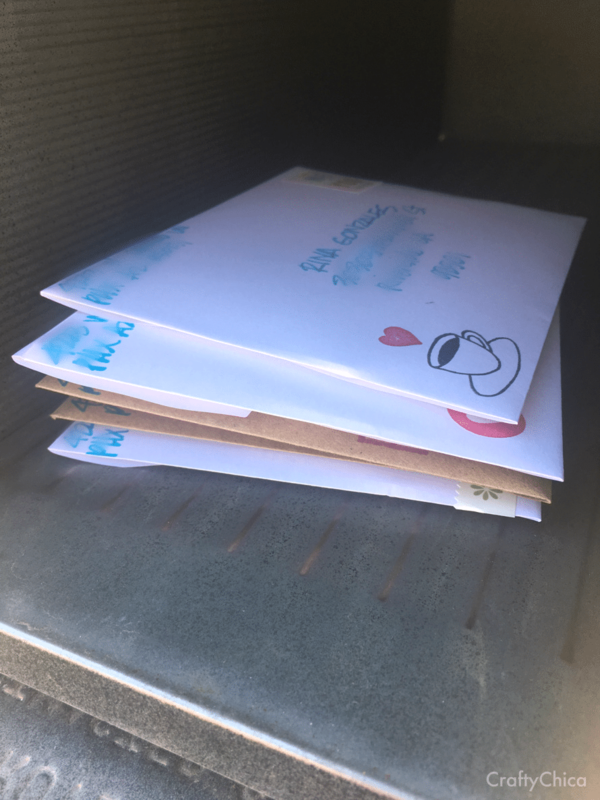 I really loved this project because as I made the cards I thought about who I wanted to send them to. The fact that the kit had everything I needed made it even easier. I love the coffee-themed one! It has an embossed card (Sizzix 660248 Texture Fades Embossing Folder On the Go by Tim Holtz) and a die cut cup and small paper embellishements and string. And a stamped piece with the coffee cup! 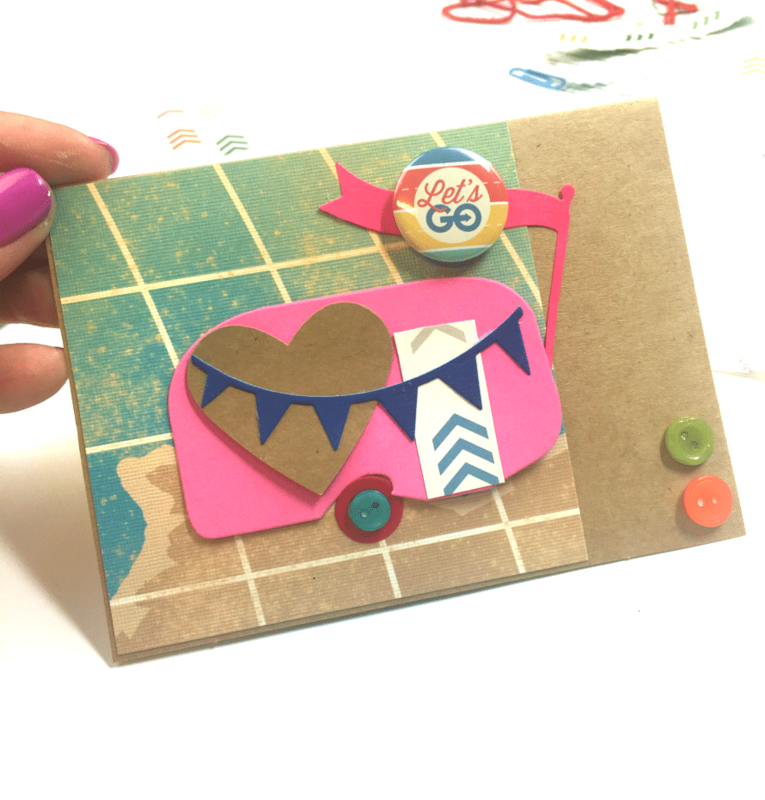 This one uses the cute mini-camper die by Eileen Hull (Sizzix ScoreBoards Die Travel Trailer, 3D by Eileen Hull). 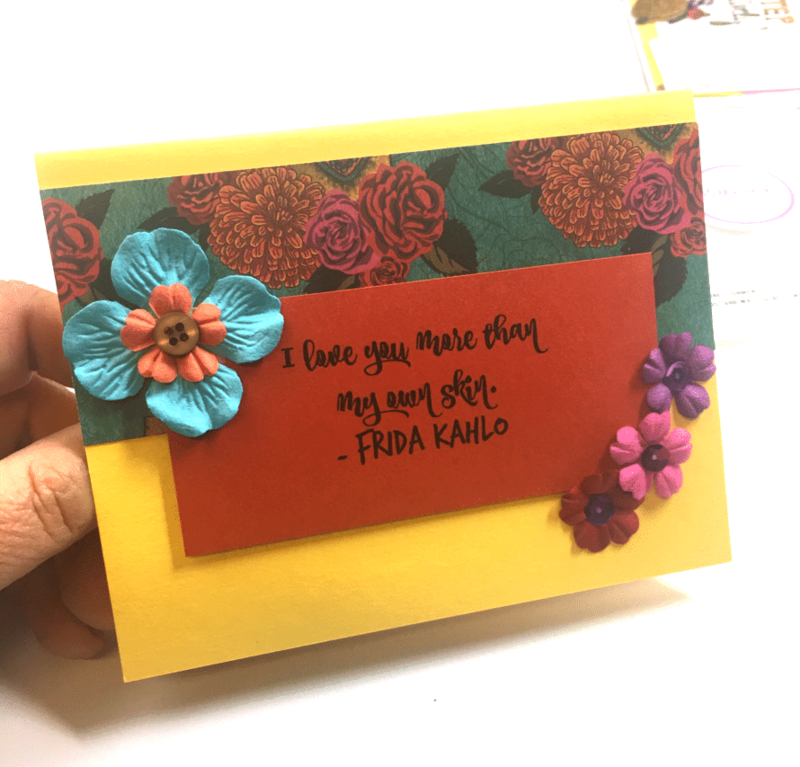 This card kit above, Rina made a whole bunch of them for us to give as swag gifts at our Phoenix Frida event last July. 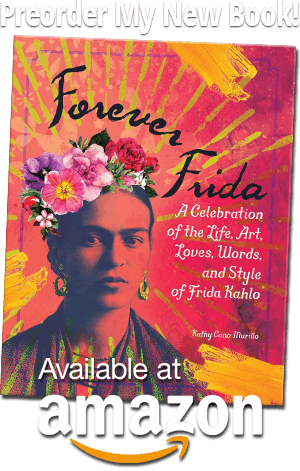 She used Sabor Papel paper (Ole Fiesta Paper Collection Sabor Papel 12 Inch x 12 Inch Hispanic Heritage 18 Sheets) and mini-paper flowers. Here’s how I finished them up! And then I popped them in the mail to send out! And it doesn’t have to be an epic reason to give one away, it can be for something small. Like your favorite cashier, or a neighbor or teacher! Think of how it will lift their day! Soooo, then guess what happened? I went loco making cards! Seriously, my arm was sore from cranking the big Shot machine! This is only half the stack! Rina got me hooked! She is my handmade greeting card enabler! And if you live in the Riverside, CA area, check out her upcoming event! i’m in Phoenix, AZ so I won’t be able to make it, but I’ll be there in spirit! Next Article10 Signs Crafty Season Has Arrived. 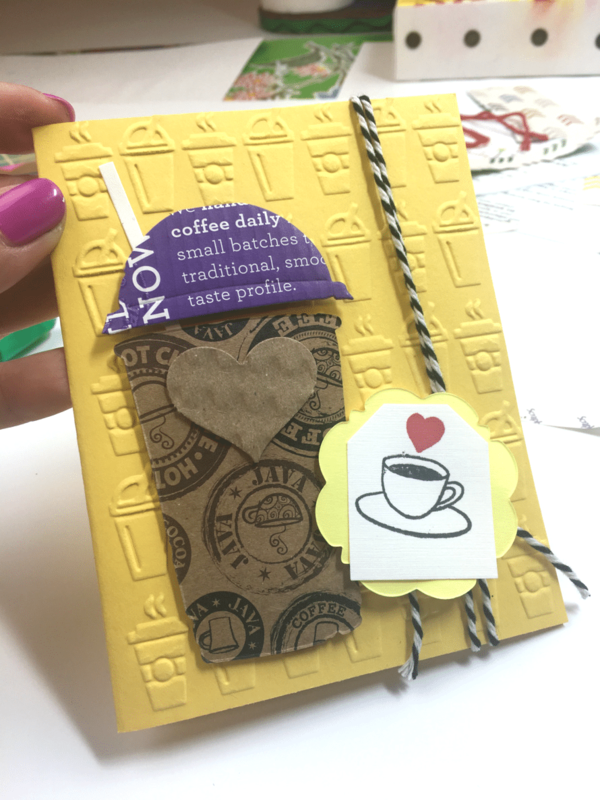 Rina is the sweetest and her card kits are super cute! Wonderful to see her featured on your blog Kathy! Thank you Kathy! 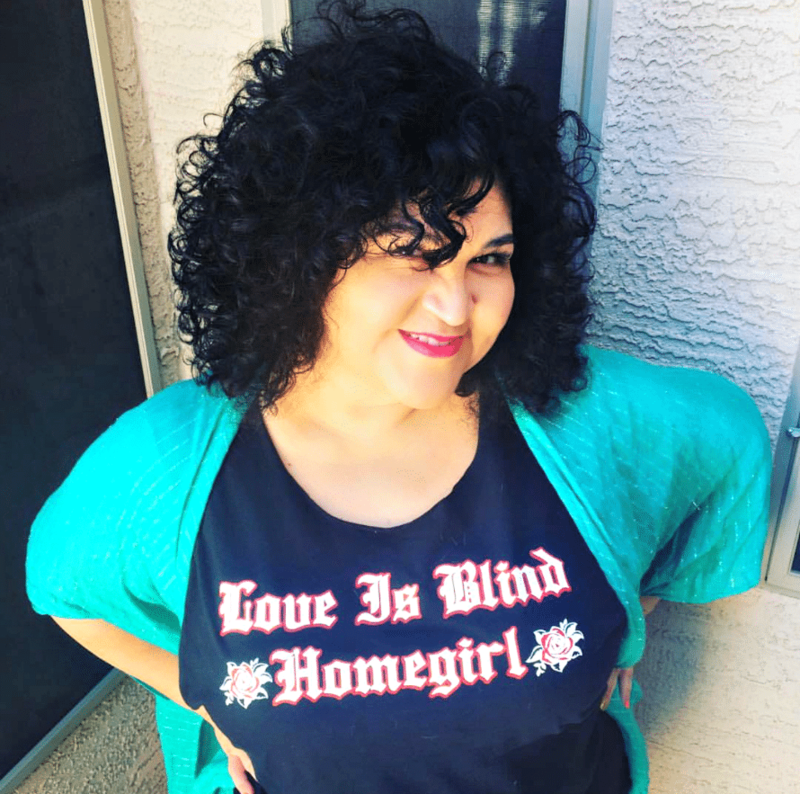 It is an honor to be featured on your blog. 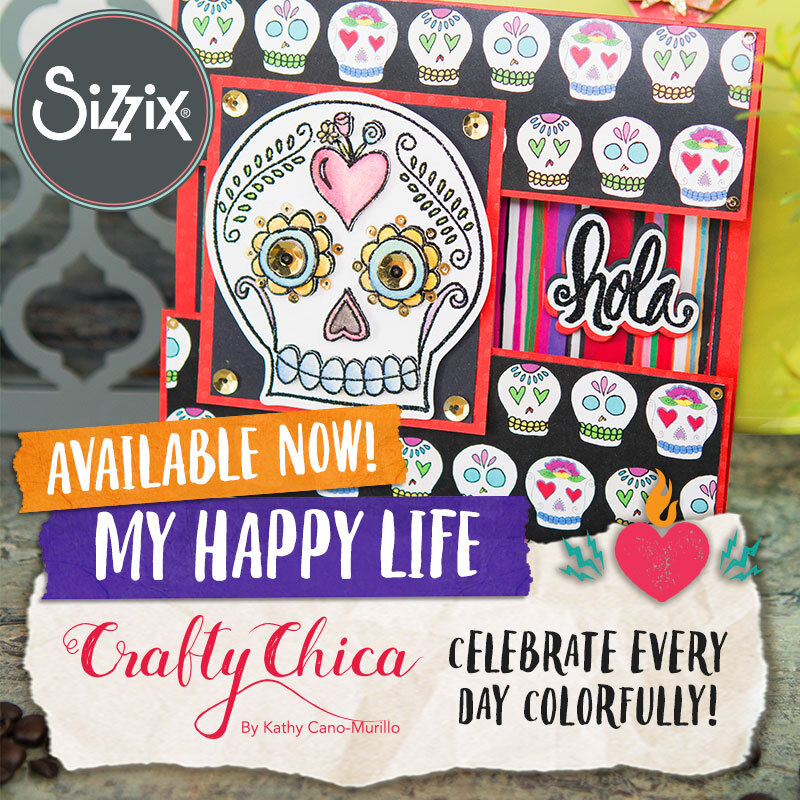 I can’t wait to make new card kits with your new Sizzix line. I have already made some awesome projects in felt. You are an amazing mentor and friend.